Women & children at the annual Tiji festival in Lo Manthang. Upper Mustang (in Nepal) is 2000 sq km of existential bliss – for some. No roads, no telephones, no televisions. Ancient and priceless paintings in crumbling monasteries in isolated villages. Hundreds of caves. 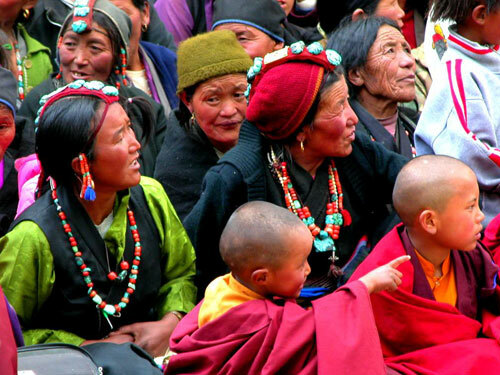 It is one of the few places where traditional Tibetan culture has been able to survive undiluted and ‘unmolested’. Untouched by time and modern Chinese colonisation, and ruled, until recently, by a king, Upper Mustang is “a living museum of the unique Tibetan culture and way of life.” Politically, it is part of Nepal, and hence escaped the cultural annihilation faced by mainland Tibet at the hands of the Chinese. It is one of the few places in the world where fraternal polyandry is still practiced – a woman may marry a set of brothers at the same time. The windswept, treeless mountain region of Upper Mustang is the northern two-thirds of Mustang District - (one of Nepal’s 75 districts) - on the border between Nepal and Tibet. It covers an area of 2,563 square km in the upper valley of the Kali Gandaki River, to the north of the Himalayan massif, and is home to over 6,000 people - the Lo or Lobas, close cousins to the Tibetans. It is also home to the Dhokpas – pastoral nomads – who move from pasture to pasture together with their animals and tents made of yak wool.